So what are YOU doing for your Spring Cleaning? Martha Stewart has a wonderful printable checklist to share. This list is in her book "Homekeeping Handbook", as well. Out of sheer curiosity, do any of y'all reseal grout lines, wash window screens or dust refrigerator coils each Spring?? Boy, I've got some work to do!!! Martha doesn't do any of that either! Her staff does it for her. LOL! I'll be lucky if I get all the furniture pulled out and vacuumed behind! Oh! Thanks for sharing that. I love lists! Don't hate me but, I do dust my refrigerator coils regularly. My mom used to do it and I just picked it up from her. One time I found one of my baby teeth down there! I wasn't raised under a cleaning mother, to put it mildly. I didn't even know that people resealed grout lines at all. But since you mentioned it, mine need redoing badly. My husband should be off next week for a spring vacation. Maybe I can add it to his honey-do list! In the eight years we've lived here, I've never ever resealed anything. You can imagine how overdue it is! Thumperdd, I had to laugh out loud when I read about your husband cleaning the screens with a pressure washer!!! Mr. U just suggested the SAME thing this morning!! HAHA!!! Oh and PLEASE would you share with me a safe way to vacuum the refrigerator coils? I can just see me ruining the entire thing!!!! And Elizabeth, should you reseal the grout lines, is there any chance that you could blog about that?? With pictures so that I could learn, too??? I am QUITE impressed, ladies, that y'all do these! I have got to get myself organized this year!! Grout lines – that’s Mr. Perfect’s department, and he does it when it needs to be done. Frige coils get dusted when we have other reason to pull the frige away from the wall. Window screens we do clean – as we live in the desert and dust abounds. Martha is great, but no – it’s not like she really cleans anything herself. And we always must consider that there are different needs for different parts of the country where we live, and different lifestyles. 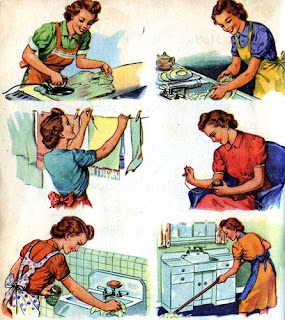 When she has a ‘how to be a perfect housewife and deep clean while home educating your 4 children’ list – I’ll be all over that! I don't do any of that, but I'm surprised that she missed cleaning out the dryer lint build-up. That's very important to prevent house fires! She knows how to do a lot. I often have the willingness to do it, but don't know how...or sometimes I never think to do the things she mentions! My big thing this Spring is to minimize all of my "stuff." I have been feeling convicted recently that I have too much stuff and I really think it is wearing me out. So....I'm getting rid of winter clothes I haven't worn in a while, and checking my Spring clothes for fit and wear since I'm switching season anyways. Next I'll go through more of my "stuff" and use it or get rid it! That is too darn funny! I guess it's a man thing. My hubby tries to wash everything with that pressure washer. He even thought about washing our Great Dane with it to keep from getting so dirty while he gave the dog a bath. He changed his mind when I threatened to bathe him right back with it! He said "Baby, that would hurt..." Well????? To vaccum the coils I use the upholestry attachment,as that will work some of the more stubborn dust off. You could go over it with a feather duster or something similiar, but then you have a small mess on the floor to clean up. Don't forget to take the ventilation cover off the bottom of the fridge and vaccum there, too. Doing both of these things helps your fridge run more efficiently and last longer, because it doesn't work as hard to ventilate or have the dust holding heat into the coils. Mrs. Mordecai - great note about the dryer vent cleaning! Birds are so bad to get into the vent covers outside. Thankfuly mine is beside the back door and I check that end regularly. oh, cyndi is so right! i do wash window screens and vacuum behind the fridge. i definitely do not regrout or re-caulk every spring - just as needed. this month we are moving into the home we just bought, so the rental house will be spotless in about two weeks - after all our stuff is out! "I got one of those long brushes last year to stick down into the lint catcher and drag out the extras. Love that thing, but I find myself mildly disappointed when very little comes out! (I know. I'm strange.)" HAHAHAHAAA!!! OOOOH, Danita!!! I have the same lint catcher thingie and I feel the SAME way when I don't pull out a huge wad of lint! LOLOLOLOLOLOLOL!!! It happened to me just this afternoon, as a matter of fact!!! Ok - seriously, that list totally stressed me out! I couldn't even finish reading the list, b/c I felt overwhelmed! What does that say about my spring cleaning??!! This list stressed you out because you are pregnant, dear!!! And if you would only share the name of your soon-to-be-here daughter with your family members, I am quite sure that would relieve some of the stress, too! HAHAHAHAA!! Oh! I had forgotten that Martha's book had that in there! I will have to open it up and get to work! I actually have a housekeeper who does that for me. She comes in and does the major cleaning once a month. I hate to say this ladies (I am assuming you are all ladies), but y'all need something else to do and think about. Perhaps you should find something important to do out in the community- at a local school, in your church, whatever, and free yourself from the urge to worry about the size of your lint balls. While there are poor children needing your help at their schools, food pantries needing volunteers, etc., I am wondering if this sort of compulsive cleaning is what Jesus would want us to do with our spare time. Being a godly wife is the best joy in the world, but what does being such a wife really mean? I am a keeper at home, a worker at home. This is what the Lord has called me to and I am JOYFULLY thankful for His calling. I am not concerned about the size of lint balls in my home, but I am concerned about keeping the home neat and tidy for my family. I do it for His glory. Surely there are sick and hurting children and adults all around us, perhaps you need to go help them instead of harrassing other people's blogs? I am FAR from a compulsive cleaner. HA! And I would love to be one that desires to clean in my "spare time", but I am not. Spring cleaning is far from being compulsive, for that matter. Spring only happens once a year. "Being a godly wife is the best joy in the world, but what does being such a wife really mean?" Not sure what you are refering to in this quote, would you are to elaborate?